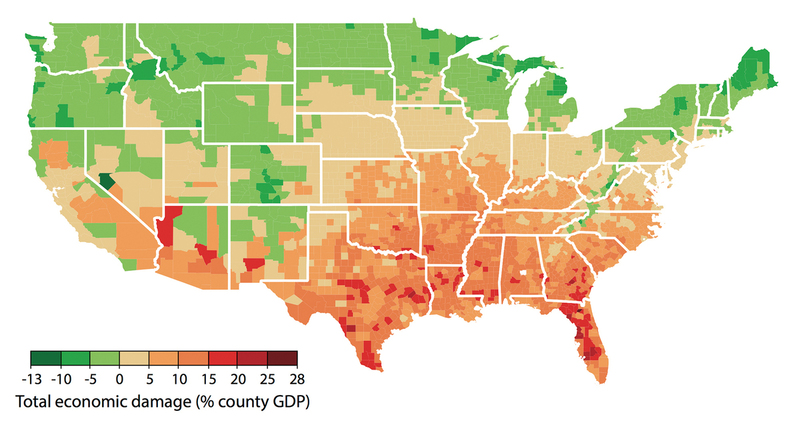 Mapping The Potential Economic Effects Of Climate Change : The Two-Way Scientists and economists predict what parts of the U.S. may get hit hardest by climate change. A new study goes county by county to gauge the potential cost of global warming. Potential economic damages are shown at the county level in a scenario in which emissions of greenhouse gases continue at current rates. Green indicates areas that could see economic benefits. To see an interactive version of this map, click here. The researchers started with history: How have heat waves and drought affected the economy in the past? Then they applied that metric to a range of future warming scenarios — from minor to extreme — and mapped the effects, county by county across the U.S. They found that if warming continues at recent rates, it could shave 3 to 6 percentage points off of the country's gross domestic product by century's end — the warmer it gets, the bigger the hit to the economy. Lead researcher Solomon Hsiang acknowledges that the numbers are uncertain by scientific standards but that they aren't really the bottom line. "I think the takeaway message that is most striking is that the effects of climate change on the U.S. are not the same everywhere," says Hsiang, an economist at the University of California, Berkeley. "Where you are in the country really matters." Colder places like New England might see an economic upturn — for example, from lower heating bills. But places that are already hot, like the South and Midwest, could see huge damage to their local economies, due to enormous electric bills, dying crops or mass migration away from the area. Maybe that is not so surprising, but Hsiang takes it a step further: Climate change will redistribute wealth by driving workers, businesses and agriculture away from those hard-hit regions and move them mostly toward the north and west of the country. Again, Hsiang says exactly how much is hard to predict. But he says that is actually part of the new study's findings: "When you start changing the climate," he says, "it starts affecting all these aspects of the economy, and it makes the future world harder to predict." Things that are somewhat easier to predict include how many more people die as heat waves get hotter, which has an economic cost associated with it. But it's much harder to envision what new technologies might emerge to help people adapt to climate change, generate cleaner electricity or remove carbon from the atmosphere. With so many uncertainties, why do this kind of exercise? Even if it's accurate, a climate change cost of 6 percentage points or even more in the national GDP will be dwarfed by an economy that will grow many times over by 2100. "Over a century, that could make up for all the losses from anthropogenic global warming and then some," says Ted Nordhaus, an analyst with the energy and environment group The Breakthrough Institute. "For citizens of wealthy societies, there is too much infrastructure and technical capacity to see a dramatic decline in living standards." He says the downside of predictions so far into the future is that they scare people unnecessarily. But economist Billy Pizer at Duke University says research like this at least brings a distant threat into focus. "It's important to figure out: Are we talking about something the size of a bread box or the size of an elephant or the size of a mouse?" he says. "And I think getting those sorts of magnitudes right, I think is really important, and I think that's what this paper does." And it continues a long-standing effort to determine something called "the social cost of carbon" (carbon dioxide being the major greenhouse gas). What's a ton of carbon pollution going to do to the economy, and should polluters pay that cost now? The administrations of George W. Bush and Barack Obama endeavored to figure out the social cost of carbon, with an eye toward charging polluters for every ton of carbon they emit. However, the administration of Donald Trump says it's not interested in the social cost of carbon or moving away from carbon-based fuels, arguing that doing so would hurt the economy. Climate scientist Chris Field at Stanford University says yes, decarbonizing the economy would be expensive, but he compares it to the space program in the 1960s. "It cost a lot," he says, "but it also unleashed a huge amount of creativity and innovation and really launched the United States on a trajectory to being ready for the 21st century." An earlier version of this story incorrectly identified Stanford's Chris Field as an economist. He's a climate scientist.